It's your chance to explore Ubud Bali with Ace Camps Travel Company. 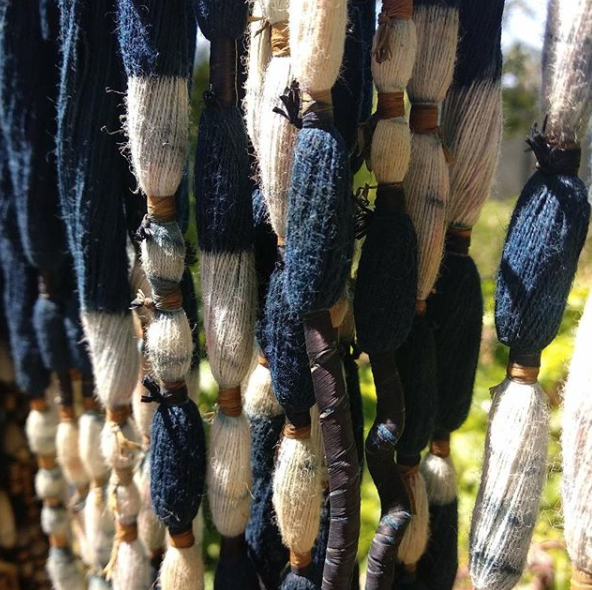 NATURAL DYEING WORKSHOP, HISTORICAL + SACRED TEXTILES OF BALI | JUNE 1 - 9, 2019 Learn More Here! 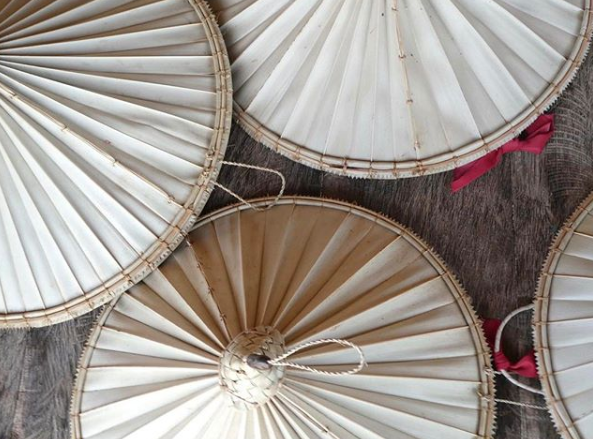 A very special textile focused adventure in Ubud Bali with Threads of Life. You will learn hands-on all about the world of natural dyeing using colours such as morinda red, tannins, mud and indigo as well batik printing + pressure resist techniques. You will travel to nearby villages with a specialized guide who will take you to meet with and watch the phenomenal art of double ikat and songket weavers. You will also enjoy a two-part lecture series on the history of Indonesian textiles, as well as the sacred textiles of Bali. William Ingram is co-founder of Threads of Life, a fairtrade business based in Bali that has worked with over 1000 traditional weavers and their families in 50 communities on 12 Indonesian islands since 1997. As co-director of the Bebali Foundation since 2002 he has led the organization’s support for sustainable use of natural dyes and other non-timber forest products by these same community groups. Through his work he seeks to demonstrate how profitable businesses can have a social mission, how community businesses can be profitable, and how both can be sensitive to the values of indigenous culture. Born in the UK and trained as a mathematician, he has lived most of his life in Japan and Indonesia. He is author of “A Little Bit One O’clock: Living with a Balinese family”. Ida Ayu Ngurah Puniari was born in Sidemen, Bali. After qualifying as a school teacher, she began working for the Siddha Mahang Foundation in 1993, researching Bali’s bebali textile traditions. Her work focused on gathering information on bebali textiles and the religious ceremonies in which they are used from several historical collections of sacred texts in lontar (palm-leaf) book form. In 1994, while continuing this research, she began teaching the bebali weaving arts at the private Siddha Mahang High School in Sidemen. This unique school has established central roles for a broad range of Balinese cultural arts, crafts and sciences in its curriculum. A year later she began to study the use of natural dyes and weaving on a continuous warp back-strap loom in the Balinese villages of Bugbug and Tenganan Pegeringsingan in Karangasem. Recognized as an authority on all aspects of the bebali textile tradition, she has made presentations and curated exhibitions across Bali, and is active on the boards of several cultural organizations around her hometown. Threads of Life’s staff dyers Komang Sujata, Wayan Sukadana and Made Maduarta, bring a combined 35 years of experience to the teaching of this workshop. Focusing on traditions that have degraded and are being recovered, they document local dye recipes and processes in the field, and test them in the studio before taking suggested refinements back to the communities. In the dye garden, they establish cultivation and harvesting methods to address plant resource scarcity being faced by traditional dyers. 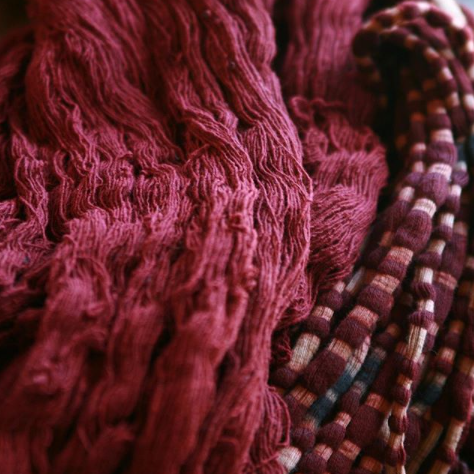 Their approach to natural dyeing seeks plant-sourced dyes by plant-sourced processes and avoids synthetic additives or mordants. 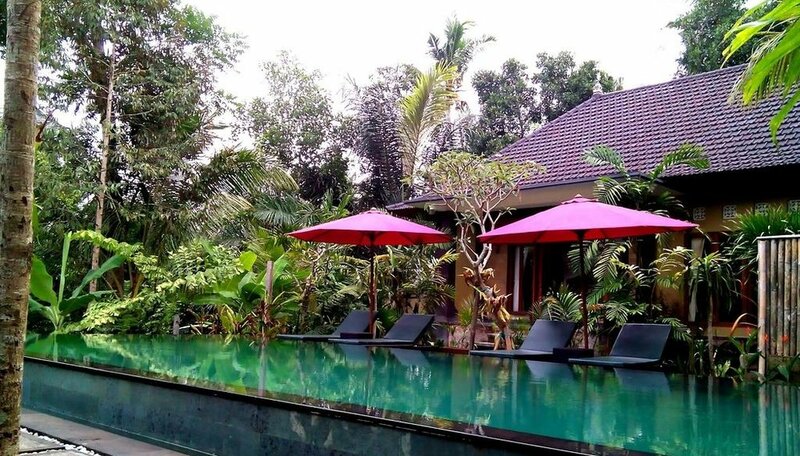 Located amongst lush greenery and rice fields our cottage villa is just a few minutes north of central Ubud. The perfect zen-like space to escape the chaos of 'downtown' is well situated to explore all of the city’s major sites. Rooms are private or shared (with one other guest) depending on final number of guests. Group Size: Minimum 9 guests and maximum 11 guests. PASSPORTS + VISAS Foreign visitors wishing to travel to Bali should be in possession of valid national passports valid for at least 190 days. Nationals of some countries require a visa to enter Indonesia, these requirements differ from country to country and are subject to change. Contact your government office to find out particulars. There will be no refunds for this Ace Camp due to the planning and logistics involved. When you register be sure to know all you can about traveling to Bali. June is a great time of year to travel to Ubud. The main rainy season should have ended and skies will likely be clear. The average temperature in June is 27°C(80°F), while the average low is 22°C (72°F), and the average high comes in at 31°C(88°F). Arrive at Denpasar Bali Airport and transfer to hotel this afternoon. Please note: Airport Pick-up is for June 1. 2019 only. Should you plan to arrive earlier to stay at the hotel you will be responsible for your own transfer arrangements. This evening we have a meet + greet welcome dinner and program overview with William Ingram. 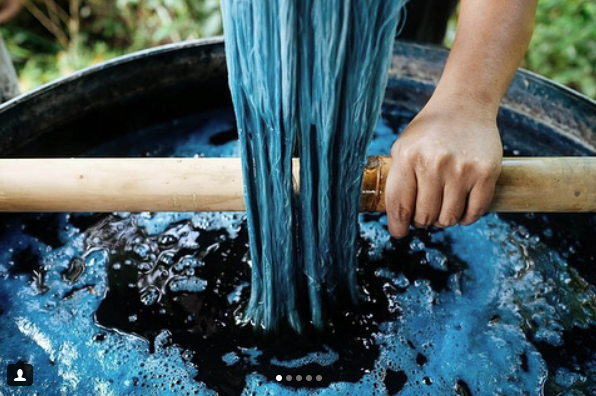 We start this morning with a introduction to natural dyes and workshop program and from here move onto learning the basics of Indigo dye vat preparation. This afternoon we will learn all about dyeing for colour gradation with indigo and tannins. Early evening transfer to hotel and Dinner at TBD. Today we start with batik sample making using canting (wax pen), cap (stamp) and brush work on cotton and silk. We will also work on dyeing samples with indigo, tannin and mud dyes. This afternoon we sample making with pressure resist on cloth and yarn (shibori and ikat) on cotton and silk. We will also continue with other dyeing samples with indigo, tannin and mud dyes. Early evening we will transfer to Threads of Life gallery in Ubud for a History of Indonesian Textiles lecture with William Ingram. 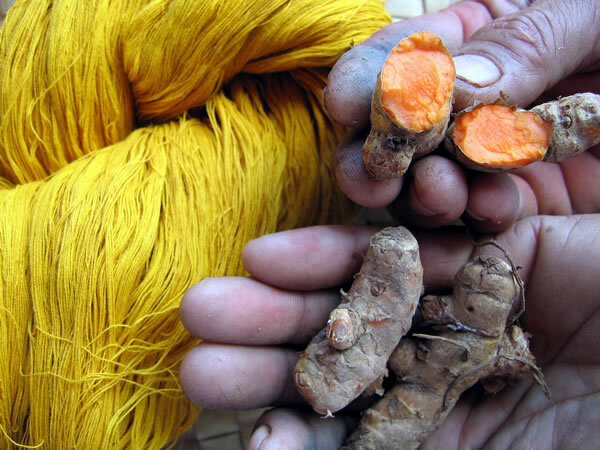 Today we will work on our own personal natural dye project at Threads of Life. Afternoon, continue with natural dye project. Today we depart the hotel early and take the bus from Ubud to Tenganan, where we will have a guided tour of the village, including a visit with double ikat weavers. We start this morning with workshop on Morinda red dye process and demonstration on cotton yarn. We will work on dyeing our yarn. Afternoon, continue with natural dyeing project. 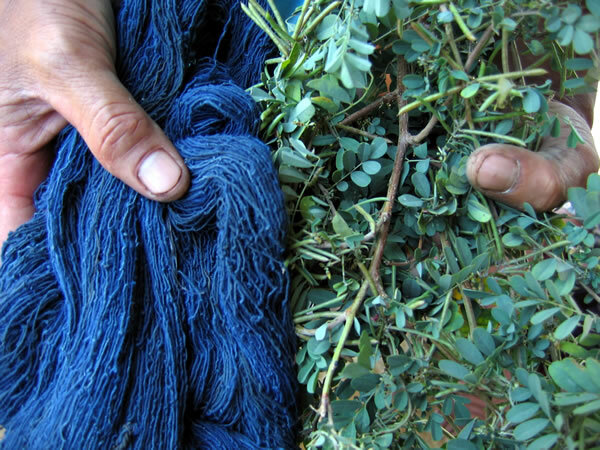 Today we will work on finishing our personal natural dye project at Threads of Life. Today is a free day for you to explore Ubud, there are plenty of things to do and see (and shop for! ), visit a spa or just relax by the pool. Late afternoon return to hotel for special group cooking and dining experience. 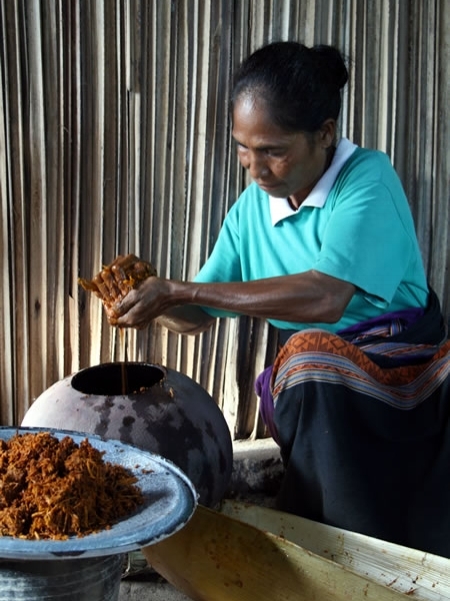 We will take a shuttle to a village outside of Ubud for and immersive Balinese culinary experience You will learn how local Balinese spices are grown and learn about their medicinal properties. Expect a hands-on, communal cooking experience during which you will grind spices and chilies on a large stone grinder, chop ingredients, and wrap fish in banana leaves, all of which you will enjoy for dinner once cooked. Departure day: After breakfast, we say our final goodbyes and head on our way.